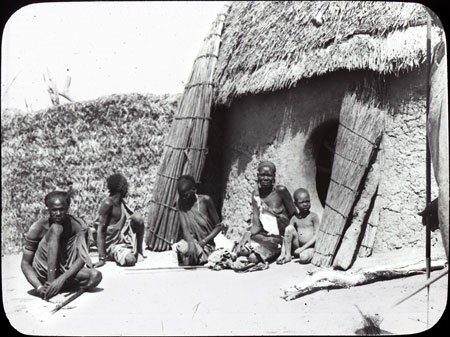 A family group sitting in the courtyard immediately outside a hut. The woman sitting in the doorway is wearing an animal skin. Against the thatch is leaning a raft used to carry objects across rivers, indicating that this homestead is probably close to the Nile. Manual catalogue entry (thermofax catalogue copy in folder '27-06 Seligman Slide Collection') - "V.g.30. Shilluk village scene"
Note on lantern slide ms ink - "V.g.30. Shilluk village scene. CGS. 264"
Morton, Chris. "Shilluk homestead" Southern Sudan Project (in development). 03 Jan. 2006. Pitt Rivers Museum. <http://southernsudan.prm.ox.ac.uk/details/1967.26.234/>.